I have been doing my work experience here at the Hampshire and Isle of Wight Air Ambulance offices as part of my volunteering unit within my Uniformed Public Services course. During my first day I had a health and safety talk and walk round the offices. I was also introduced to everyone in the office and started making a Who’s Who guide. I also did some packing of merchandise. On my second day I learned about how van runs for money pot collections are planned and I continued with my guide and merchandise packing. I helped to gather uniforms from the store. Later in the afternoon I watched a meeting about the Lottery Fundraising Services where the Deputy CEO was present. On my third day I worked with the volunteer team who had asked me to research community centres and libraries in Hampshire and the Isle of Wight and how to contact them. I started my fourth day by helping with the safety check of a van before they went out on a van run. Afterwards I helped with the stock check and learnt about how the Air Ambulance office places purchase orders with suppliers. In the afternoon I helped to sign in collection pots that had been collected during the van run earlier in the day. I helped to gather uniforms for more volunteers and continued to research community centres and libraries. 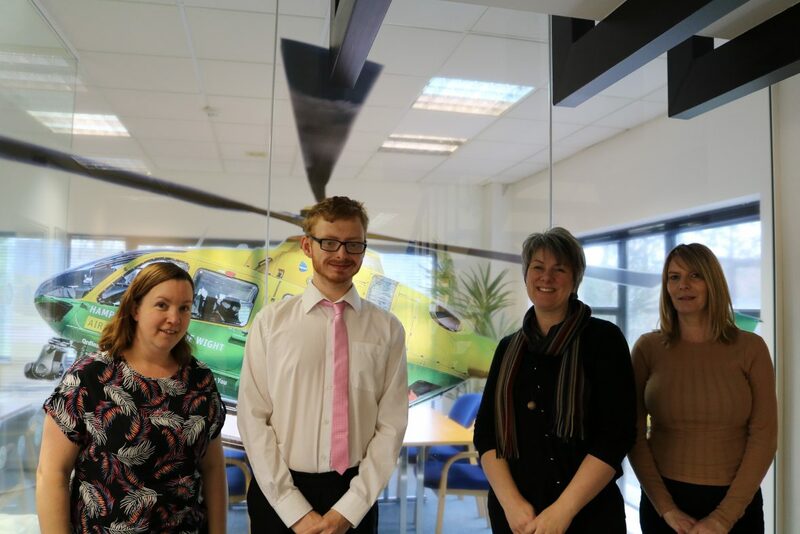 I have enjoyed my work experience placement so far; I have liked learning about how the Air Ambulance operates. On the first day of my second week of work experience at the Hampshire and Isle of Wight Air Ambulance offices (7th-12th of April) I was helping with unloading a van after it had been at an event during the weekend. I also steam pressed table clothes and folded them so they could be returned to storage. Later in the day I was preparing the charities merchandise ready for them to be sold. On the second day I started to research business centres on the Isle of Wight. I also saw how purchase orders are made and authorised for the accounts team. Later, I was helping to collect uniforms for the new volunteers. On the third day I was continuing my research and helped to bag an order from the online shop so it could be posted to a supporter. On the fourth day I assisted with the safety check on a van before it left the office and later helped to sign in the collection pots when the van had returned. On my last day of work experience (12th of April) I saw how information is logged onto data records and wrote this blog about my second week. I have enjoyed my time here at Hampshire and Isle of Wight Air Ambulance and thankful I had the opportunity to do my work experience here. Thank you for all your help, Joe!